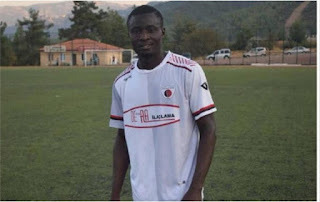 23-year-old Nigerian footballer, Ekundayo Ebenezer Mawoyeka has died after suffering a heart attack during a Saturday match in Turkey. The young striker who plays for Sarayköyspor in the Super Amateur League collapsed in the 35th minute of the game against Ye?ilköyspor at the Servergazi Stadium and was rushed to the Servergazi State Hospital where he was confirmed dead. According to Turkish website,Haberturk, the match was abandoned due to the incident.